We are a family run business and have been supplying dyed shrimps to fishermen for over 35 years. 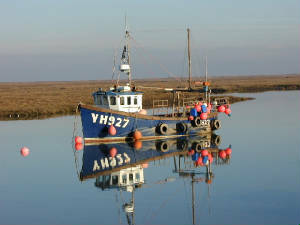 We ensure the freshness and quality of our shrimps by collecting them straight off the boats as they dock in Norfolk. We will receive a call from our suppliers to say that the fishing boats are on the way back to harbour and we go and meet them to ensure the freshness and quality that our customers expect. Our shrimps are then ready to be supplied to our customers in sealed bags ready for use. We post our shrimps to UK and Northern Ireland using first class mail (included in the price) and so, if the order is placed before 2pm, they are despatched the same day and usually arrive the following day. If it is essential they arrive the next day we are happy to arrange “Guaranteed” next day delivery through our delivery providers. We will post to other locations on request. Recently we sent an order to Russia so nowhere is too far away! "..... Thankyou so much for your excellent service over the last few years. You have changed my fortunes." "..... Thank you very much for telephoning me about the postal strike affecting my last order. I am glad to say the shrimps arrived without problem and caught a 15lb salmon and a grilse - it was well worth the risk in sending them." "Thank you for such a quick delivery."